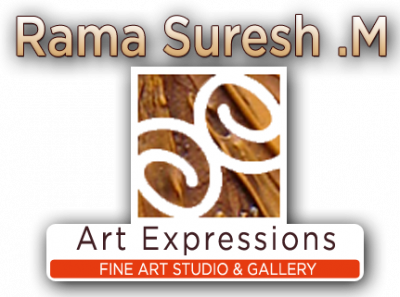 Rama.Suresh has established himself as an artist who understands the lives of people of the geographical area he paints about. 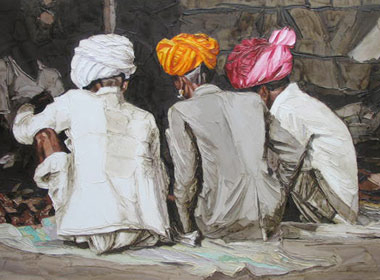 For instance, in his depiction of the paintings of Rajasthan, the paintings come alive with the culture, the lifestyle, and the moods of this state, which comes through in his paintings of the characters, and the periodic architecture of this state. His masterpieces also concentrate on creating a long-lasting impression on people through the body language and postures of his figures, rather than through their facial expressions. He goes to the extent of claiming that for him the facial expression does not convey the feelings so much as the body language of the figurine. Each of his paintings tells a story; it urges one to give it a concrete structure and dimension, by its depth of meaning and message, personifying it into eloquence. It is interesting to note that none of his works is framed, conveying the fact that his life or his work is not limited by precincts or boundaries. He has experimented with various techniques of texture and colour and believes in art adding character and value to people's lives. He pours his soul into each painting. Each of his painting is a conception by itself: He infuses a bit of his own life into each of his paintings; His total involvement and dedication that goes into a painting is as much as his creative urges and the paints that he uses. According to him, every single piece of his art is almost his ultimate masterpiece. His technique of painting has inspired many and has caught the attention and appreciation of the art world, and he works towards keeping this interest alive. 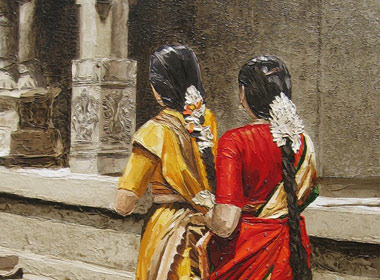 This artist has taken a vow to preserve our culture and dying traditions and wants the world to open its eyes and take a look—at him, and through his paintings, at India. 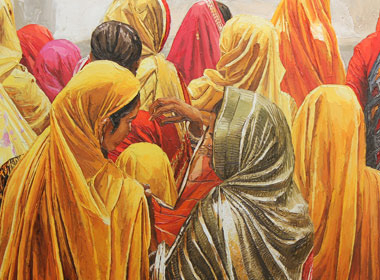 Rama.Suresh’s paintings introduce you to the places and people that make India so special. Passionate about art right from his childhood, he never had any doubts about taking it up as his vocation. 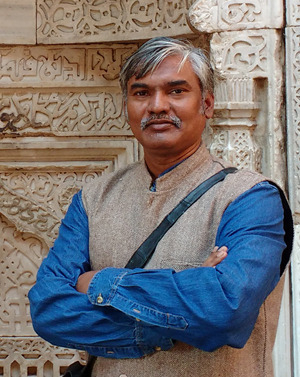 He attained his M.F.A degree from Government College of Art and Crafts, Chennai, and has been guided by eminent artists such as Dr. Alphonso A. Doss, Mr. R.B.Bhaskaran, Mr. C.Dakshinamurthy, Mr. G.Raman, S.K.Rajavelu, Mr. J.M.S. Mani, and Mr. Rm. Palaniappan. I want my art to appeal to everyone and be understood by people of all ages. In today's world, where everyone looks to the west to enrich their lives, I am inspired by the inherent ethnicity and traditions in our culture. Travelling the length and breadth of our vast country, I have painted real-life portraits of different people and cultures that have had an enormous impact on me. My work has as its backdrop, the history of a particular place, encompassing the architecture depicting the period. I hope that my paintings have a similar effect on its viewers.